Affiliation: Mr. Demarest is the director emeritus of the Center for Biocommunications at the College of Physicians & Surgeons, Columbia University, New York, NY. General Biographical Description: Soon after finishing his education as a medical illustrator he began his career at the College of Physicians & Surgeons. He spent his entire career at Columbia. He has received many awards for his work, but is most proud of being the honored recipient, in 1995, of the Crosby Medal for Excellence awarded by Johns Hopkins University School of Medicine. He received the Lifetime Achievement award from the Association of Medical Illustrators in 1989. He twice served as president of the Association of Medical Illustrators and served as chairman of its board. 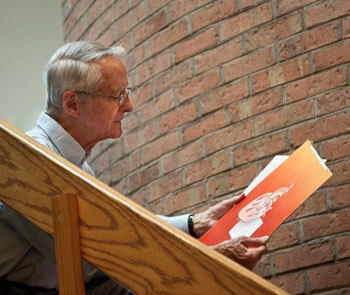 Upon his retirement, Columbia’s Health Science library has requested his records and medical illustrations for their permanent archive. He is currently preparing them for acquisition by Columbia University. His work has appeared in dozens of medical textbooks, countless research papers, medical journals, and many popular magazines, such as the Reader’s Digest, Life, Newsweek, and Time. He spent much of the last few years as medical illustration editor for the Cleveland Clinic Journal of Medicine and more recently for the OBG Management Journal published by Dowden Health Media. He is author and co-author of several books, one of which has been translated into 5 foreign languages (Demarest and Sciarra. Birth, Conception & Contraception. McGraw-Hill, Inc. 1969-1976.) This book, for the general public, was revised and republished in 1995 by Parthenon Publishing. He is also co-author of the Human Nervous System by Noback & Demarest. The 7th edition of which was published in 2012 by Springer-Verlag. Laryngeal Biomechanics (Harvard University Press) with Raymond Fink as senior author, is a definitive exposition of the functions of the human larynx . It won the Anesthesia Foundation Award for the best book in anesthesiology published for the years 1978 and 1979. Special Interests: His love of watercolor painting and fly-fishing led him to study Winslow Homer and that started him on an odyssey that has consumed him for the past several years. He traveled to all the places that Homer visited throughout the western world, and painted and fished where Homer painted and fished. He has lectured widely on Homer and published a book based on his Homer research entitled, Traveling with Winslow Homer. When not painting watercolors he can usually be found fly fishing on his favorite streams.